The Payment Term is to identify the payment method to either the Suppliers or Customers. The term can be Cash On Delivery, 30 Days or etc. The term usually will be specify in the Purchase Order, Sales Quotation, Sales Order or Invoice screen. 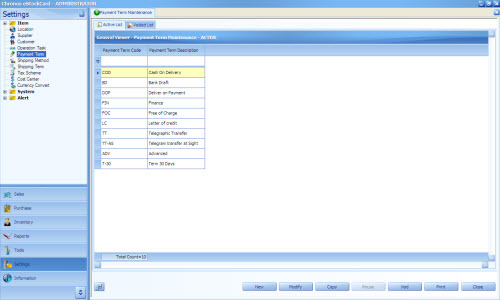 By default some terms had been created in the eStockCard v3 Inventory software. For the unavailable payment terms, the user are free to create it from the Payment Term setting screen. 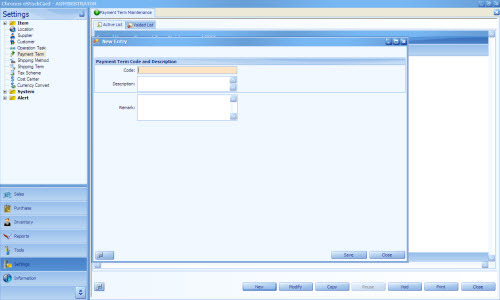 Setp 2 Enter the relevant Payment Term Code and the Description for it. The code can be either alphanumerical.